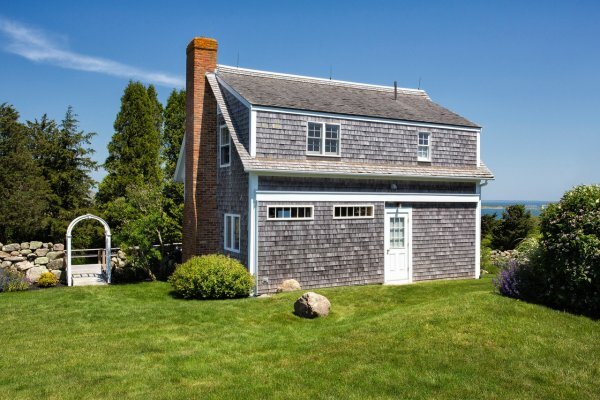 Loveys Cottage is the guest cottage of a historic Landmark House, the famous Tower House. The cottage feels private with excellent separation from the main house. There are pondviews from almost every window, and the cottage is cozy and inviting. The living room is furnished with exquisite comfortable leather couch and beautiful overstuffed chairs, plus window seats. The kitchen is functional and well equipped, open to the dining area with Bay window and seating for 6. There are two full baths, one on the first level and one upstairs, 3 bedrooms, and of course WIFI and Cable TV plus landline phone are provided. Open the door to a sweet deck with the best views of the pond and a charcoal grill for your outdoor cooking. There are several Adirondack chairs for your comfort on the deck.